Whether you take shorter showers, reduce food waste or make ecominded choices at the grocery store, adopting one simple habit can make a difference in protecting Earth’s natural resources. These simple, renewable lifestyle changes may even affect your personal mindset. 1. Choose products in renewable packaging. Choosing food and beverage products in renewable packaging is a natural extension of environmentally friendly habits, such as recycling or composting. From milk and soup to water and juice, you can find food products packaged in cartons – primarily made from paper, a renewable resource from growing forests. 1. Buy only what you can consume. At the grocery store, it’s easy to overshop, especially if you’re hungry. Buy only what you need to reduce waste and seek groceries that are considered renewable, such as fruits and vegetables, and carton-packed food and beverages in packages made from renewable materials. Cartonpacked foods last longer, are easy to store and have a relatively low environmental footprint. 2. Use reusable containers. These days , hectic lifestyles are the norm and that often means meals and beverages on the go. When possible, rely on re-usable drink and food containers instead of disposable ones. 1. Whenever you can, bike or walk instead of driving. According to data compiled by National Geographic, it takes nearly 13 gallons of water to produce each gallon of gasoline. Using alternative modes of transportation and taking care to combine errands, car pool and use public transportation help cut water and energy demands. 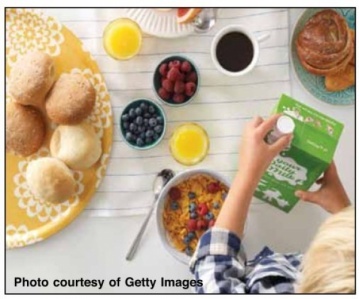 To learn more about how making simple, renewable lifestyle changes can help boost happiness or to take the Habits of Happiness quiz to assess your personal happiness level, visit tetrapak.com/us/renewableliving.